French painting in the nineteenth century was at the heart of a revolution which had profound and lasting impact on art. There is no need to exaggerate its achievements, but many who should know better – or at least take a few moments to check their facts – are creating and popularising myths. This article tackles one of these: that painting outdoors using oil paints was somehow ‘invented’ by the French Impressionists, or by their immediate antecedents such as Eugène Boudin. The production of completed paintings en plein air using oil paints is well documented over a period of well over a century before any of the French Impressionists was even born. Art history has to rely on four main types of evidence: the paintings themselves, the writings of artists themselves, the writings of their contemporaries, and later writing. Each has different levels of reliability, but ultimately the only thoroughly reliable evidence is complete physical examination of paintings. Even that can be misleading or doubtful: it remains hard to be sure which drying oil(s) were used in many paintings, for example, because of their very complex chemistry. It is not possible to prove that any given oil painting was painted completely en plein air. An excellent example of this is in Callen’s (2015, pp 224 ff) examination of Gustave Caillebotte’s work Laundry Drying on the Banks of the Seine, Petit Gennevilliers (c 1892). 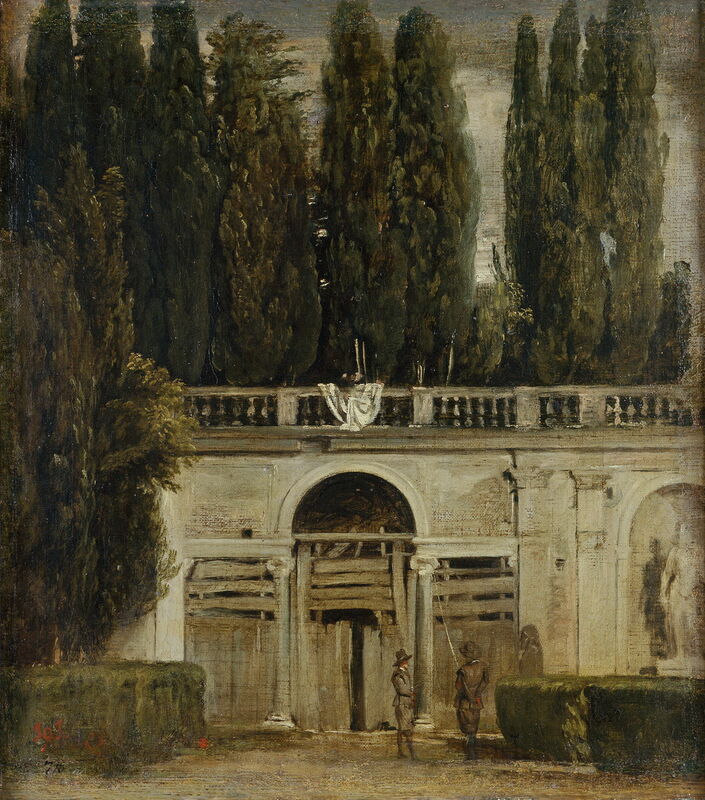 The discovery of a poplar bud in the paint layer appeared to be strong evidence that the painting was at the very least started outdoors, but Callen points out that the bud was out of season and the trees shown were not poplars, making that evidence much harder to interpret. One more obvious issue, which appears to have escaped notice, is that the canvas was large at just over 1 by 1.5 metres. If the day was as windy as is depicted in the painting, then keeping that large canvas in position on an easel would have been a major challenge, let alone painting on it. Some habitual plein air painters have certainly provided for much larger canvases, up to more than 2 metres high, to be secured in strong winds, but those are exceptional and there is no evidence that Caillebotte resorted to such unusual measures. Arising from this is the important consideration of whether it would have been feasible for any given painting to have been completed en plein air. Many art historians appear not to have practised plein air painting in oils, and quite often seem happy to ascribe extremely complex and detailed works, clearly the result of several weeks’ work, as being painted outdoors. Some painters worked very quickly indeed – Pissarro for instance – but in conditions of changing light and shadows, it is hard to work on any given painting for longer than a couple of hours at a time. Monet, Cézanne and others apparently made multi-session plein air paintings by moving around a set sequence of locations and canvases each day, but this requires fairly settled weather and lighting conditions, and is a challenge. include debris from the local site, such as sand grains, seeds, and vegetation. It is surprising how many paintings have been considered to have been painted en plein air but show none of those characteristic features. There has been considerable speculation that some of the founding fathers of landscape painting, including Nicolas Poussin and Claude Lorrain (Clarke, 2015), made oil sketches en plein air, but none of those works seems to have survived, and the only evidence for Claude is in Joachim von Sandrart’s less than reliable biography of him; indeed, von Sandrart (1606-1688) claims it was he who introduced the techniques of plein air oil sketching to those painters working in Rome from 1629. As von Sandrart is not known for his landscapes, and none of his surviving works appear to be plein air oil sketches, this remains open. Clarke (2015) considers on appearance alone that Claude Lorrain’s Landscape with a Goatherd and Goats (c 1636-7) may well have been painted en plein air, but I do not think that such a detailed and finished work could have been painted completely outdoors. Another candidate for very early plein air painting is Velázquez’ View of the Garden of the Villa Medici (c 1634), which certainly has more of the appearance of a plein air work, but may have been worked on considerably in the studio. To date, the first generally accepted plein air oil sketches are those of Alexandre-François Desportes (1661-1743), but I have been unable to locate any usable images of those landscapes. As a professional painter of hunting scenes and animals, their significance was not recognised for a long time, and he does not appear to have handed his techniques on to any pupil or other successor. Plein air oil sketching was also described, and recommended, by Roger de Piles in his book Cours de Peinture, which was published in 1708, contemporary with the work of Desportes. Other books on painting and art in the eighteenth century also cover the topic, and Claude-Joseph Vernet (1714-1789) was recorded as having painted oil sketches en plein air, but again none has survived. The next significant exponents of the plein air oil sketch were the early landscape painters of the Roman campagna, including Pierre-Henri de Valenciennes (1750-1819) and Thomas Jones (1742-1803). The latter was a pupil of Richard Wilson (1714-1782), the founding father of Welsh painting, who was also believed to have painted in oils in the Roman campagna, but none of whose oil sketches survived. When you are next in Paris, you should visit the Louvre, and seek out its remarkable collection of Valenciennes’ oil sketches on paper. They are of modest size, and as they provided an image library for his production of studio works, were never intended for public eyes. But it is easy to see in their spontaneity and colour the inevitable progression to Impressionism. Valenciennes became professor of perspective, and published very influential textbooks on perspective and painting in 1799 and 1800, which were still in use when the Impressionists were active; these recommended the practice of plein air oil sketching. Jones’s tiny jewel of a painting hangs in London’s National Gallery, and is worth seeking out when you are next in London. Another work on paper, it could only have been painted in front of its motif, but it is unlikely that he intended it to be seen by others. By the end of the eighteenth and into the early nineteenth century, painters were flocking to Rome, to go out and paint oil sketches in the campagna. Among these was the Norwegian, Thomas Fearnley (1802-1842), who travelled to Rome and produced some fine plein air paintings, until his early death from typhoid. Over this period, some painters – probably those who worked on plein air paintings over the course of several daily sessions – started to sell those works, rather than keep them for use as studies for studio works. 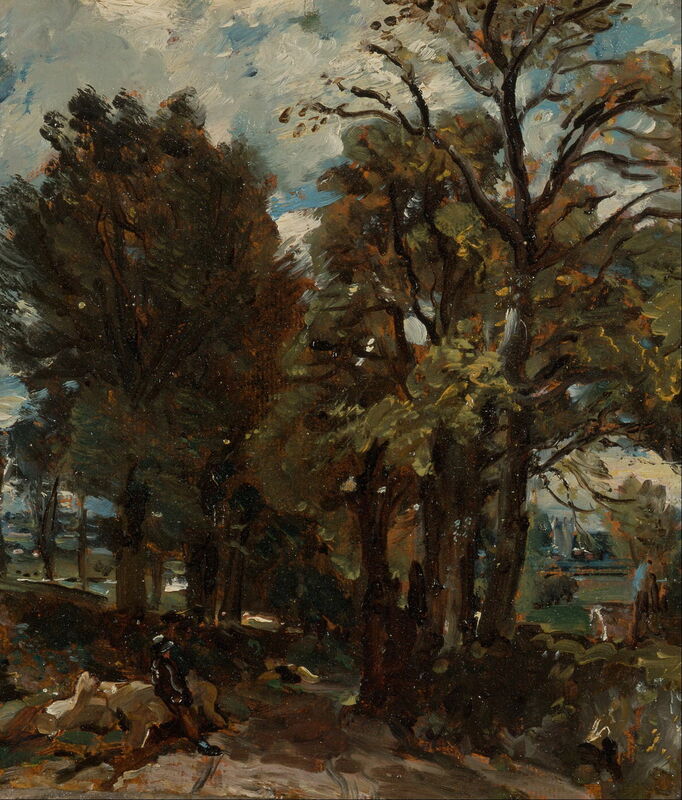 Another notable early British enthusiast for oil sketching was John Constable (1776–1837), who only ever used his sketches as preparation for studio works, which were finished to standards expected by the Royal Academy. John Constable (1776–1837), Fen Lane, East Bergholt (c 1811), oil on paper laid on canvas, 22.1 x 19.5 cm, Yale Center for British Art, New Haven, CT. Wikimedia Commons. 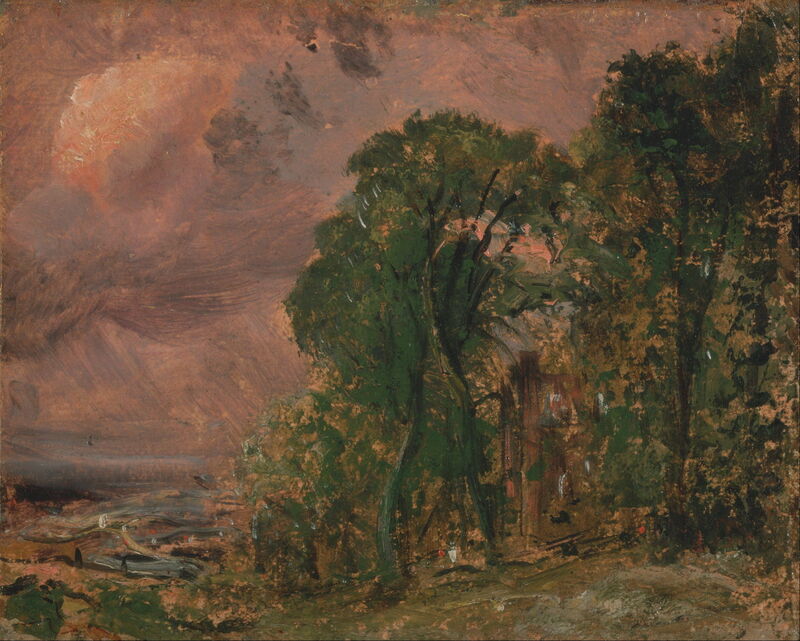 Although by no means confined to Constable, he was known for his practice of skying, painting different types of sky, which he accompanied by detailed notes on the weather. Most important to the later development of Impressionism were the plein air paintings of Jean-Baptiste-Camille Corot (1796-1875), a pupil of Achille Etna Michallon (1796-1822), who in turn could trace his art back to Valenciennes. 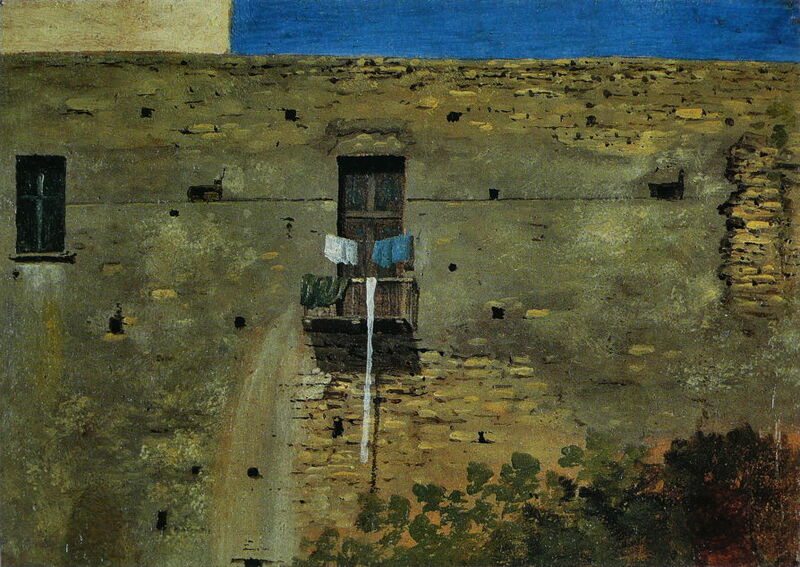 Jean-Baptiste-Camille Corot (1796-1875), View of the Convent of S. Onofrio on the Janiculum, Rome (1826), oil on paper mounted on canvas, 22 x 33 cm, Fitzwilliam Museum, Cambridge, England. WikiArt. 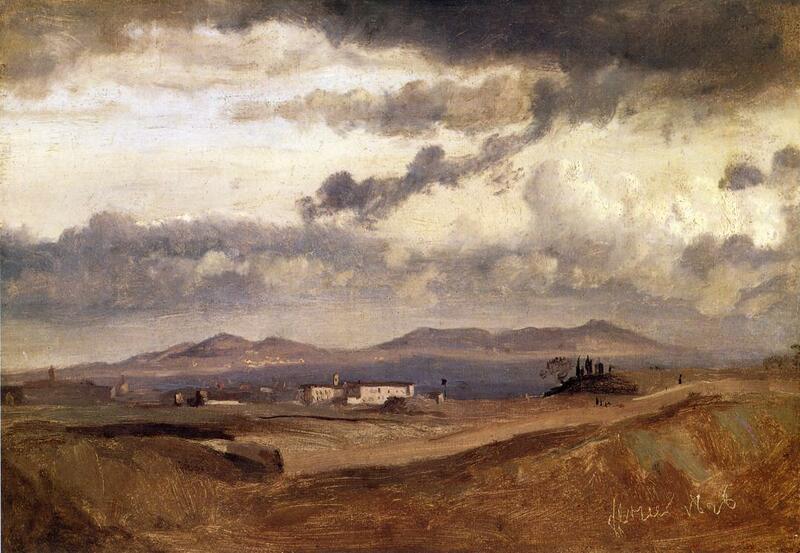 Corot painted voraciously in the Roman campagna during his first stay in Italy, from 1825 to 1828, where his skills as a plein air painter became second to none. 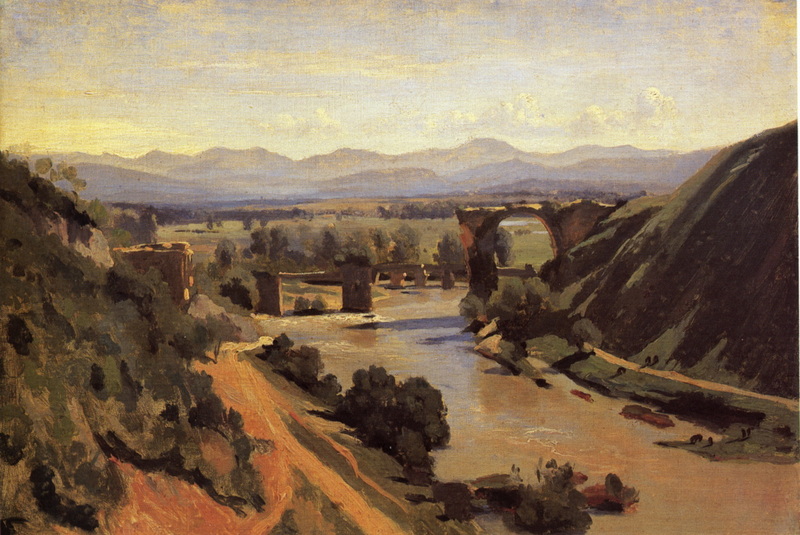 Jean-Baptiste-Camille Corot (1796-1875), The Bridge at Narni (1826), oil on paper, 34 x 48 cm, Musée du Louvre, Paris. WikiArt. Painters working en plein air in the countryside around Rome came from across the whole of Europe: here, for instance, is an oil sketch by Carl Blechen (1798-1840), from Germany. 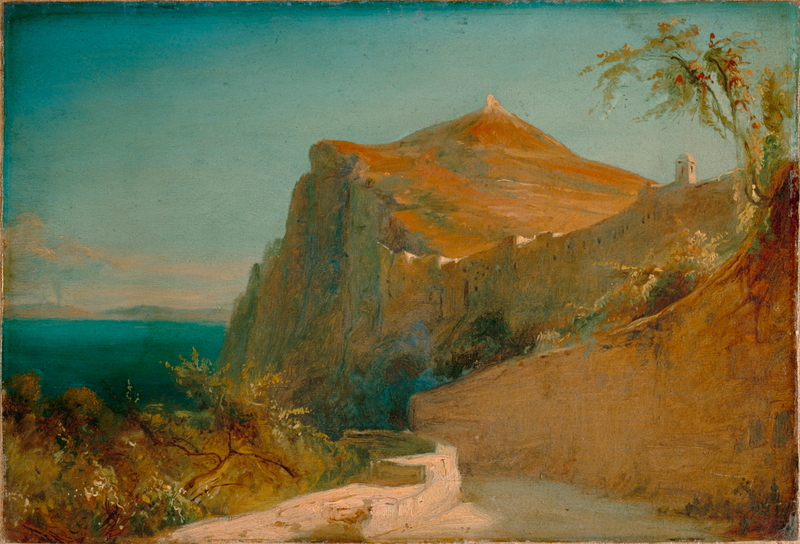 Carl Eduard Ferdinand Blechen (1798-1840), Tiberiusfelsen auf Capri (Tiberius Rocks, Capri) (1828-9), oil on paper mounted on canvas, 20.5 x 30 cm, Lower Saxony State Museum, Hanover. Wikimedia Commons. There are many examples of the work of others in the Gere Collection, documented and illustrated so well by Riopelle & Bray (2012). Is any of this really important to Impressionism? There is no doubt that plein air oil painting was very important in the early years of Impressionism. But the concept of plein air painting is probably far more important to the Impressionist illusion and mystique: that of the lonely artist, who in the fleeting moments of a spectacular natural effect, dashes off a brilliant masterpiece. That was of course not the way that it worked, but Impressionists maintained that illusion even when their paintings, which bore the marks of hasty brushstrokes, were carefully honed and tweaked over months in the studio, as we know Monet’s Grainstacks series of 1890-1 were. As regards the legacy of Impressionism, plein air oil painting continues to be a popular mode of work, and many glorious paintings are completed en plein air today. But almost everything in ‘modernism’ turned its back on painting outdoors. There is also the absurdity that this ignores the rich and very extensive body of work painted entirely en plein air in watercolours and other media. Even Dürer did that, and some (myself included) have completed single-session paintings en plein air using egg tempera (in my case, admittedly using tubed egg tempera paints). So let us not create or parrot claims which are patently false. Riopelle C and Bray X (1999/2003) A Brush with Nature. The Gere Collection of Landscape Oil Sketches, Yale UP. ISBN 1 85709 998 2. Sumner A and Smith G eds (2012) In Front of Nature. 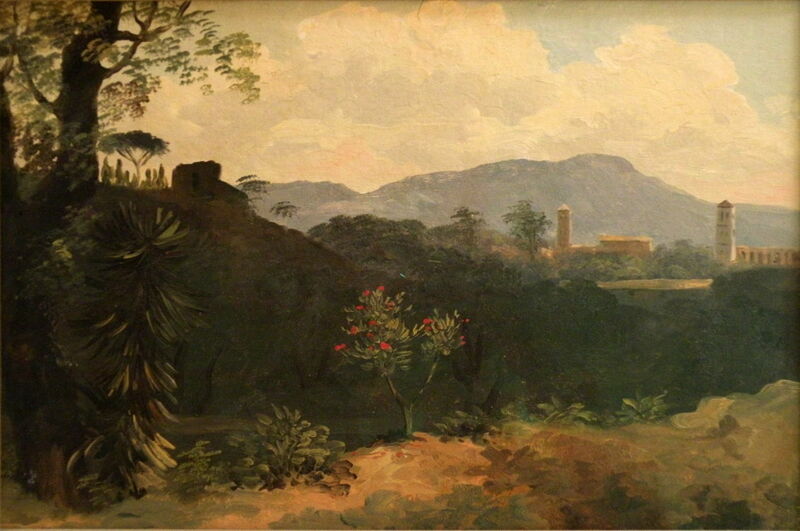 The European Landscapes of Thomas Fearnley, The Barber Institute. ISBN 978 1 907804 10 6. Posted in General, Painting, Technology and tagged art history, Blechen, Constable, Corot, Desportes, Fearnley, Jones, oil painting, painting, plein air, Valenciennes, Velázquez, Wilson. Bookmark the permalink.